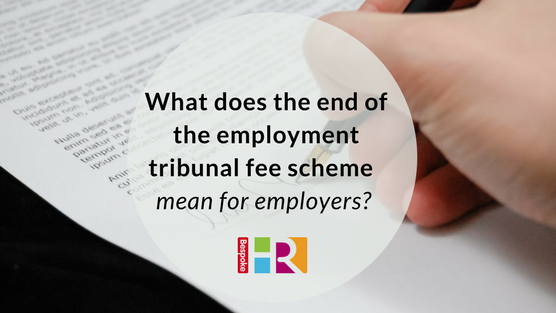 What does the end of the employment tribunal fee scheme mean for employers? At the end of July, the Supreme Court ruled that the employment tribunal fee scheme, introduced by the Government in 2013, was unlawful. Not only that, but that it was void from the day it was launched. Trade union Unison successfully argued that the level of fees was impacting on employees’ access to justice. As a result, all fees dating back to 2013 will now have to be repaid (estimated at £32 million). The fees were introduced in 2013 to cut the number of weak or malicious cases successfully making it to court, and indeed there were 79% fewer cases over the following three years. But Unison argued that in fact, these fees were hindering workers with real claims receiving justice – leaving “badly treated staff with no choice but to put up or shut up” according to its General Secretary. What does this mean for small business owners employing staff? One argument is that because of the fee abolition, we could now see an increase in claims – particularly as employees are free to represent themselves. In the past, these fees meant the employee was much more likely to think twice about bringing about an employment tribunal claim and there could now be a rise again in malicious and weak cases. It is therefore more important than ever for business owners to protect themselves, and get things right when it comes to employing and managing staff. Employment contract – every member of staff you hire should have one. This should be signed by both parties as soon as the employee joins the company, but at the very least within 2 months of the commencement of employment. If you don’t have an HR Manager, it’s worth outsourcing this task to professionals to make sure your contracts are watertight, legally compliant and have both sufficient contractual force and protection to ensure you have the strongest foundations possible to deal with tricky situations. Employee handbook– effectively a rule book which details your company policies and ethos and aims to ensure both manager and employees always act in a manner compliant with employment legislation. Never forget about the protection afforded to employees by the Equality Act of 2010, which aims to protect employees from unfair discrimination. Remember the broad scope of the act; even job applicants and ex-employees are protected and therefore you must always have its ethos at the forefront of your mind. Record HR meetings and reviews – keep a log of all HR activities, including reviews and appraisals, so that you can refer to it if needs be. Ensure managers are kept up to date and are trained upon key pieces of employment legislation. If in doubt about best practice, take professional advice. To find out how to protect your business, contact us.